What do you do, as a country, to attract more than the 1.5 million visitors a year that you’ve already got? 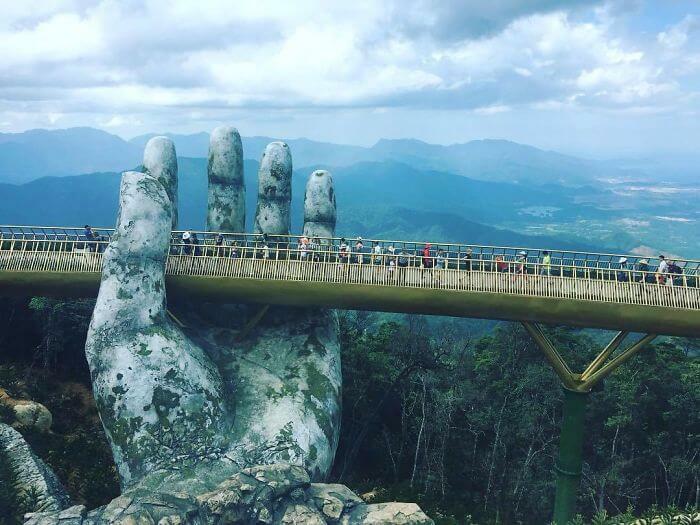 You invest more than two billion dollars in building a structure that will leave people in awe at the simple sight of it, the kind of structure that looks like out of the legends book. 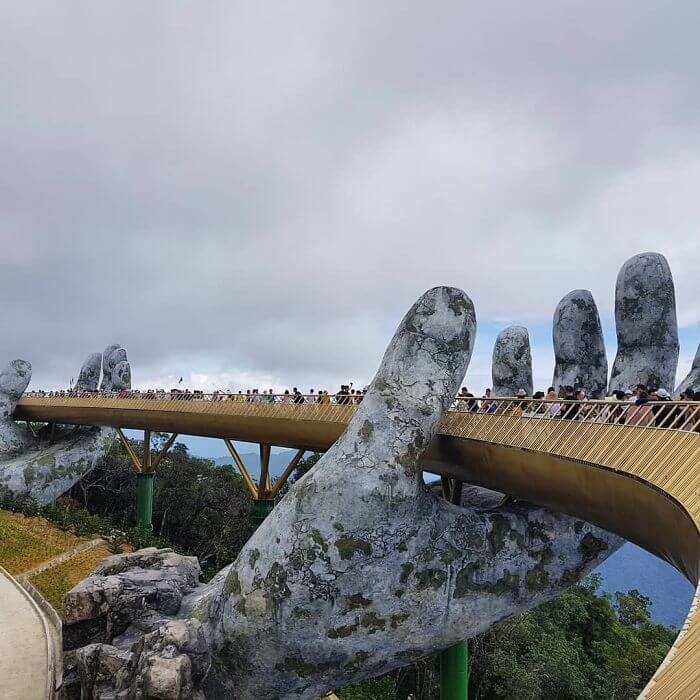 It features a gorgeous bridge held by two giant rock sculpted hands and offering a breathtaking view of the surrounding countryside. 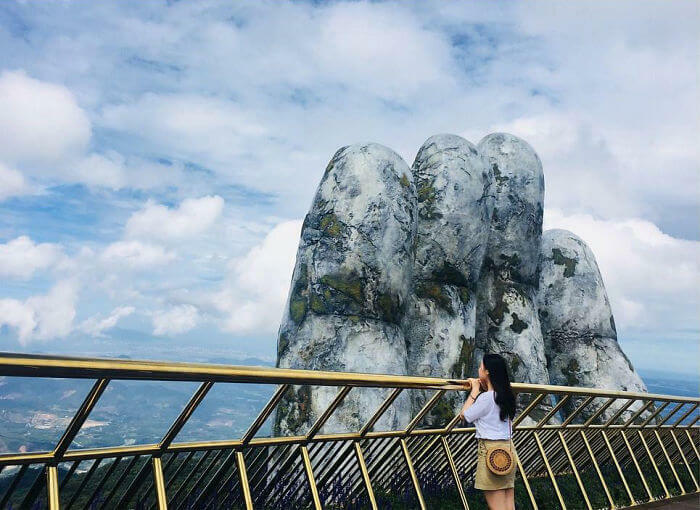 Vietnam is on to a tourism boom. 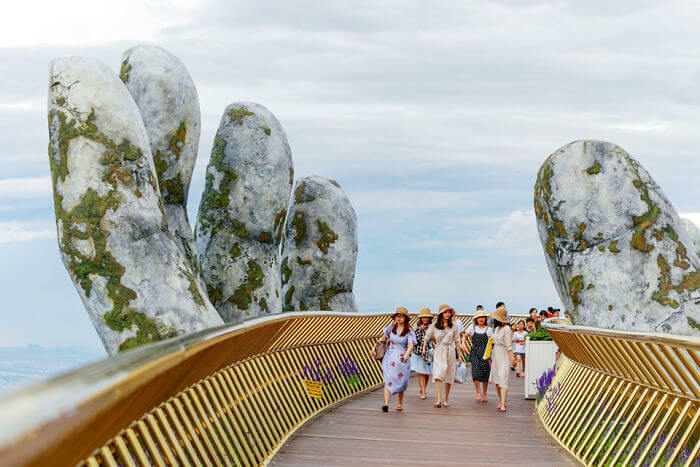 Although it looks as majestic as an ancient structure, the bridge is brand new and was opened to the public in June this year. 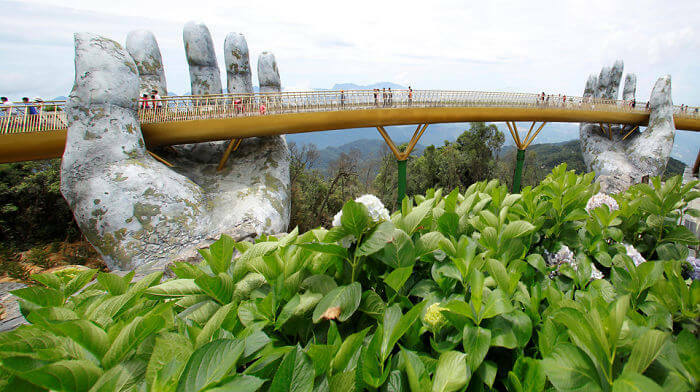 It stands at 1,400 m above the sea level guarding over the Ba Na Hill Station resort. 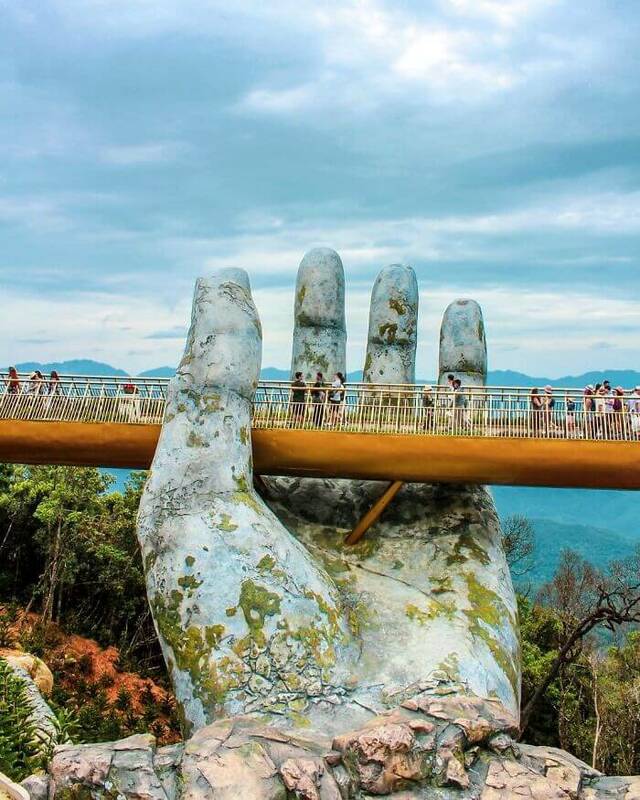 Known as the Golden Bridge, this impressive structure will give you the experience of a lifetime. 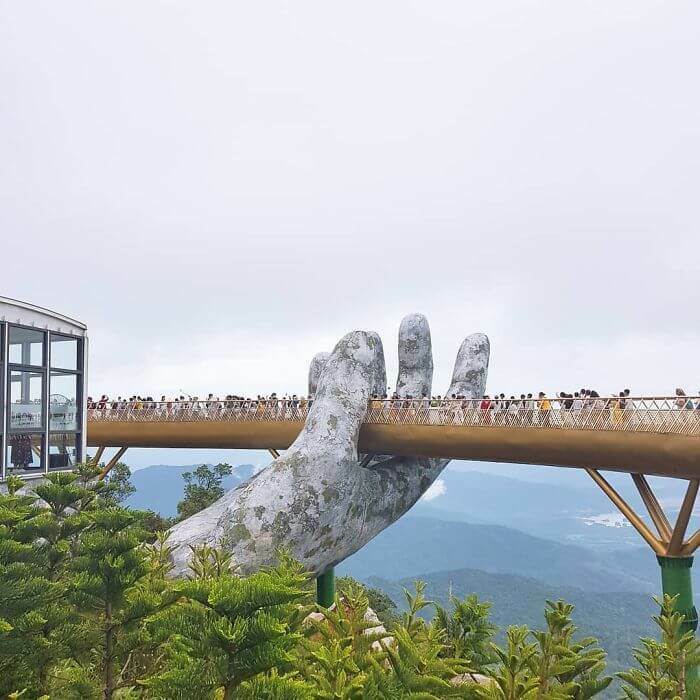 It’s like you’re walking down a bridge held by the hands of a 1000 years-old titan meant to protect the humans crossing the Ba Na Hills. 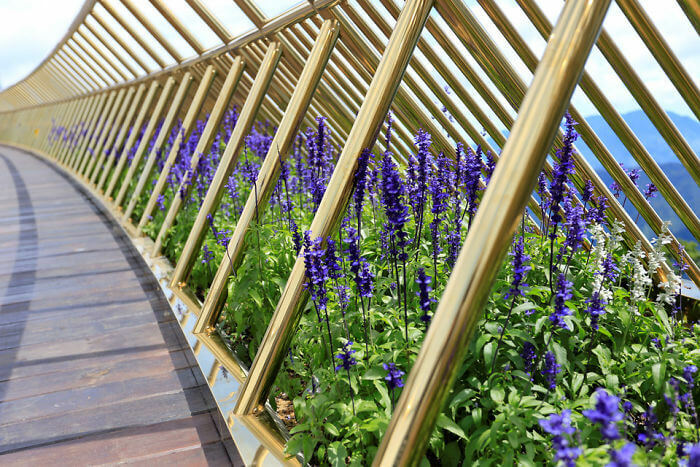 The walkway is 150 meters long, it is gold (oh, yeah) and arranged with purple Lobelia Chrysanthemums. 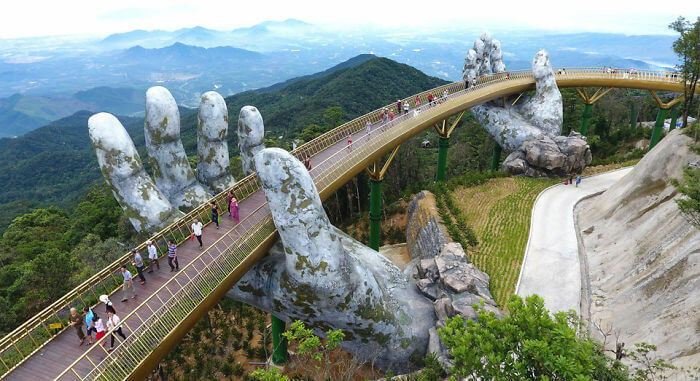 The design is elegant and you will feel a little like a king walking down this bridge. 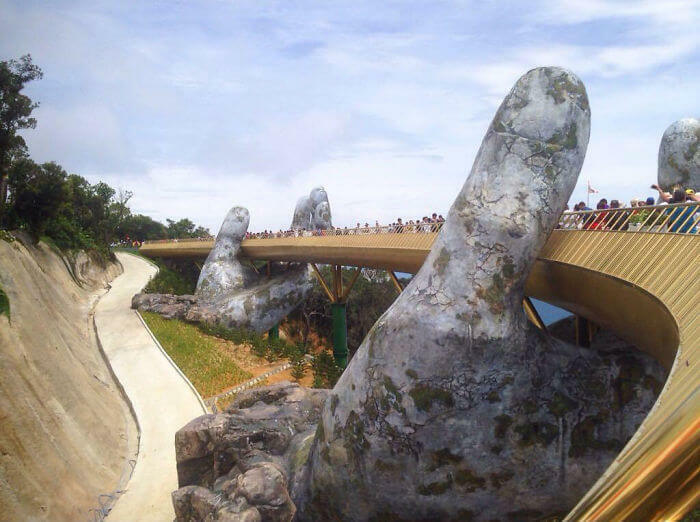 The design was made by the architecture firm called TA Landscape Architecture. 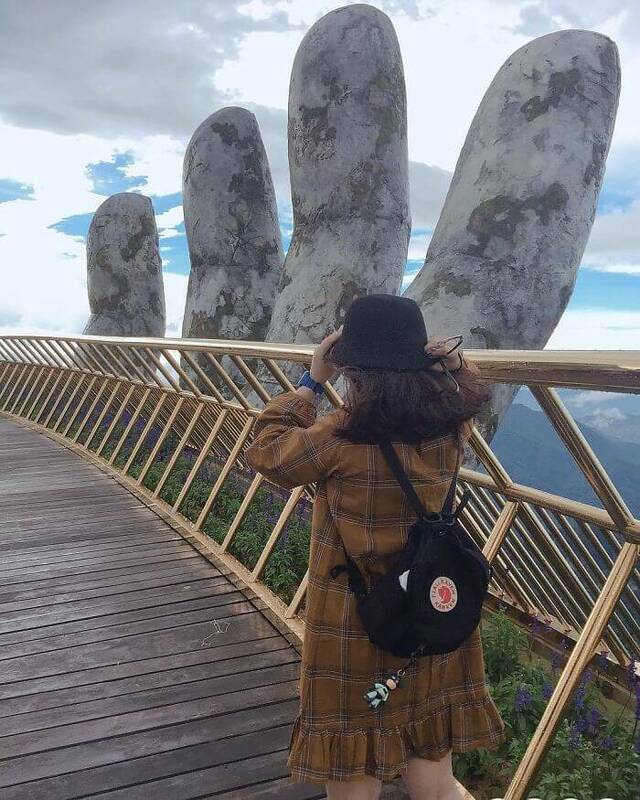 Remember when you were telling you about those big rock sculpted hands? 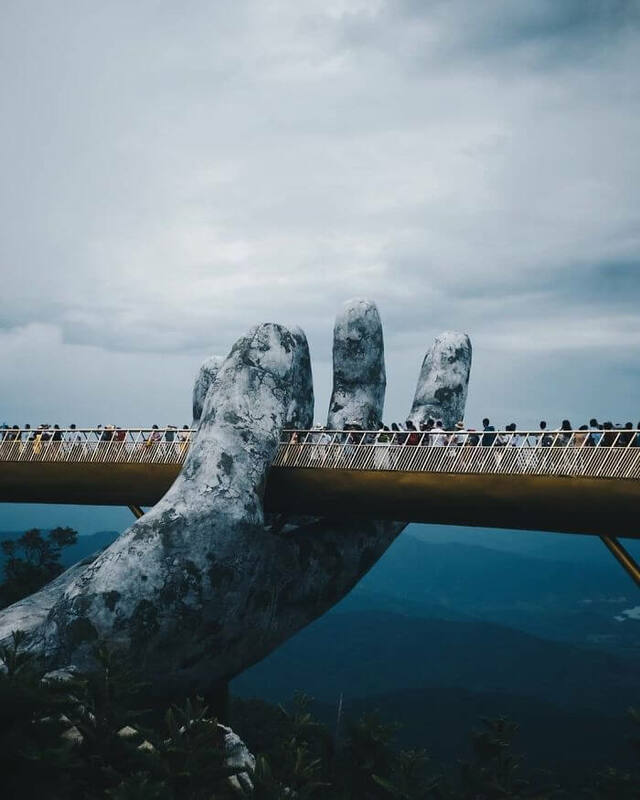 Well, they are made to look like rock, but they’re actually made from steel with a fine finishing that gives the whole structure an ancient-modern look that will leave you in awe. 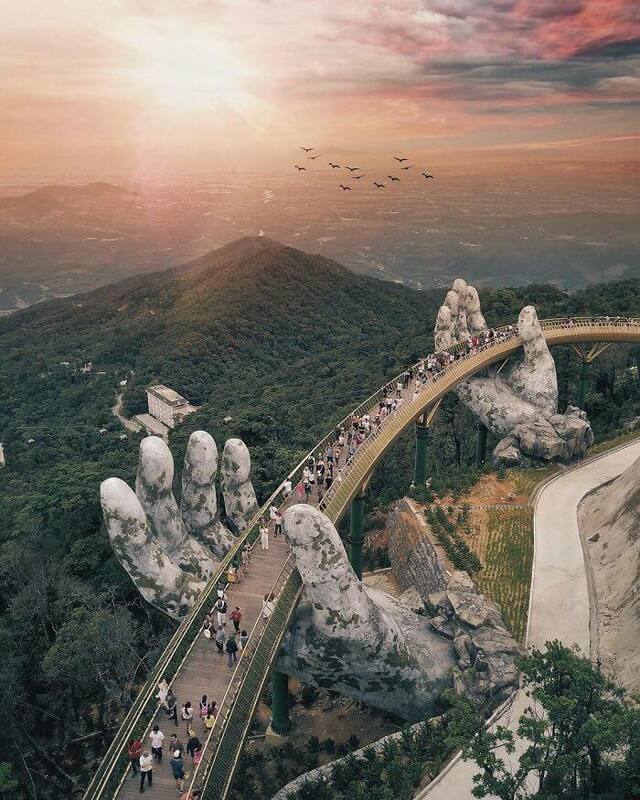 “We designed the skeleton of the hands and covered them with steel meshes. Then we finished with fiberglass and added the theming on it. 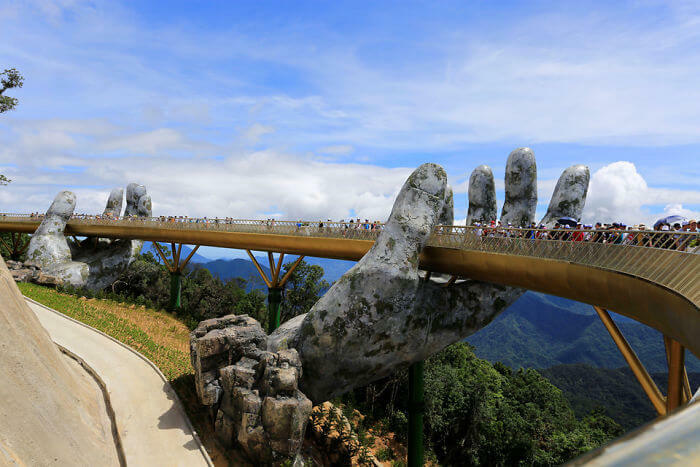 The entire construction of the bridge took about a year”, said a representative of the company. 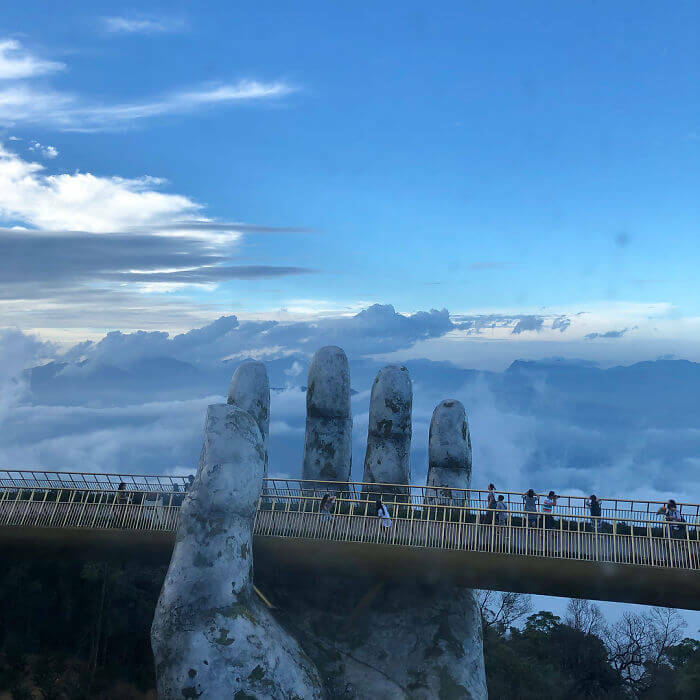 Vietnam is experiencing a tourism boost as more and more people start visiting this mysterious country that the world that doesn’t know much about. Apparently, they know how to take advantage of this raise in the number of annual tourists. What do you say? 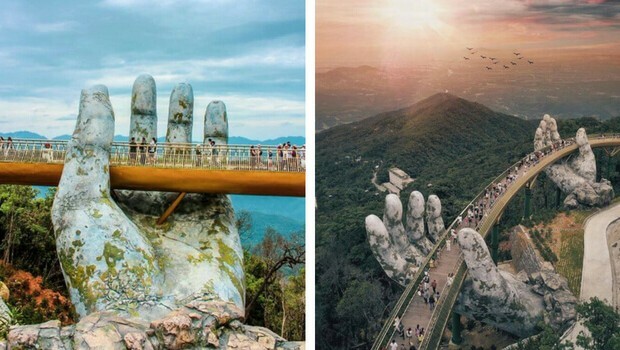 Is this Golden Bridge alone worth a trip to Vietnam?